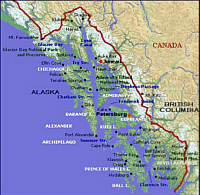 Southeast, Alaska's panhandle, stretches approximately 500 miles from Icy Bay, northwest of Yakutat, to Dixon Entrance at the US/Canadian border. Massive ice fields, glacier-scoured peaks and steep valleys, more than a thousand named islands, and numerous unnamed islets and reefs characterize the area where few flat expanses break the steepness. 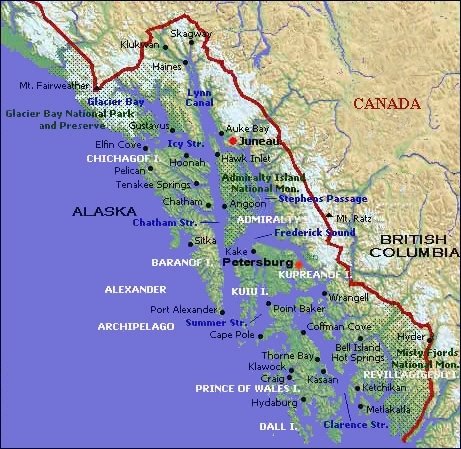 Geography gives Southeast its other name, the Inside Passage, referring to the hundreds of islands of southeastern Alaska that shelter the inland waterways from the heavy storms of the North Pacific. These protected channels form a calm and scenic steamship lane. 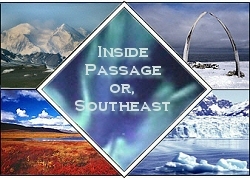 Inside Passage is an area previously frozen in the last ice age. It's a dramatic region of huge rainforest trees, glacier-garbed mountains, and countless islands ranging in size from the nation's third largest to tiny, one-tree islets that are strewn like confetti along the channels and fjords. The region measures about 125 by 400 miles, with 60 percent of the area consisting densely forested islands of the Alexander Archipelago. Carved by glaciers and blanketed with majestic hemlock, spruce, and cedar, the coastal islands which form the Alexander Archipelago, many of which are the size of small states, are part of the earth's largest temperate rain forest. A host of unique wildlife inhabits the old-growth forests found here, and the nutrient rich waters around the islands support a diverse ecosystem of marine life. Some of the largest populations of humpback whales found anywhere make this area a summer home while feeding and raising young whales born in the waters around Hawaii during the winter. This region has a mild, maritime climate, making it a prime habitat for bald eagles, sea lions, and porpoise. Roughly half of the state's bald eagle population lives here, and where orcas and humpback whales come to feed in the summer. Some of these islands, such as Baranof, Chichagof, and Admiralty are many miles in length and breadth. High mountains covered with dense forests rise from the narrow beaches of the mainland and the larger islands. Along the shores of the numerous inlets and channels are scattered mining and logging camps, salmon canneries, and lonely little towns. There are over 33 communities scattered mostly on islands through Southeast. Juneau is the largest with about 30,000 people. Smaller fishing villages may have only a few hundred residents. In the entire region, roughly 70,000 people call Southeast home. A compressed geography means that ocean tidewater brushes against 4,000 foot mountains capped by glaciers and ice fields. About 20,000 years ago, during the Great Ice Age, virtually all of Southeast Alaska was covered by ice. Only peaks reaching above 5,000 feet reached through the glaciers. Today their sharp points contrast with rounded mountains that were smoothed by the glacial advance. The ice retreated about 10,000 years ago. Then about 2,000 to 3,000 years ago there was another, though smaller, glacial advance called the Little Ice Age. Today's Southeast Alaska glaciers are remnants of this last advance. They're the ones that carved and polished the Southeast landscape we see today. There are three major ice fields: the 1,500 square mile Juneau Ice Field just behind the capital city, the slightly smaller Stikine Ice Field near the communities of Wrangell and Petersburg, and the Brady Ice Field in Glacier Bay National Park. Another dominating part of the Southeast geography left behind by the glacier's retreat are the saltwater fjords. Some still have active glaciers calving mammoth ice blocks into the ocean. Glacier Bay National Park and Preserve, once called Thunder Bay because of the roaring sounds made by falling ice, is the result of glacial retreat. Situated about 90 miles northwest of Juneau, this grand collection of tidewater glaciers is a wondrous blue ice land that encompasses 3.3 million acres. The waterways provide access to some 16 of these glaciers, a dozen of which actively calve icebergs into the bay. This is a land comprising three climatic zones and seven different ecosystems supporting an amazing variety of animal life: humpback whales, Arctic peregrine falcons, common harbor seals, black and brown bears, marmots, eagles and mountain goats, among many others. Man's habitation of the Glacier Bay region dates back approximately 10,000 years, but it appears that early settlers didn't stay here for very long. As you can imagine, making a home around Glacier Bay was not easy. Tlingit folklore includes tales of periodic village destruction from shock waves and other natural forces. 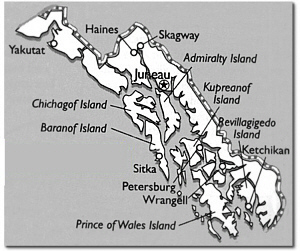 European exploration of Glacier Bay began in 1741, when Russian ships of the Bering Expedition sailed the region's outer coast. Glacier Bay was barely a dent in an icy shoreline when the English explorer George Vancouver passed by nearly 200 years ago. At that time, what is now the bay was filled with a wall of ice extending more than 100 miles to the St. Elias Mountain Range. The face of the glacier spanned over 20 miles, and in places it was more than 4,000 feet deep. But, it wasn't until famed naturalist John Muir came to this icy wilderness in 1879 to explore its flora and fauna that scientific investigation and early tourism were spurred. On September 10, 1899, a violent earthquake struck the Glacier Bay area. This caused enormous slabs of ice from the Muir Glacier to calve, thereby choking the waterway. Excursions to this sector ceased until 1925, when Glacier Bay National Monument was established. Hubbard Glacier flows over 90 miles through the Wrangell-St. Elias National Park and Preserve to Disenchantment Bay, the head of Yakutat Bay. While at present the Columbia is retreating, the Hubbard is advancing, as it has for more than 100 years. In 1986, the Hubbard began a surge, a period of rapid glacial advancement, which reached a dramatic climax before the end of the year. By springtime, the glacier had completely blocked off Russell Fjord from the sea, creating a rapidly rising freshwater lake. On October 8, 1986 the dam gave way. A flood of ice, water and debris crashed into Disenchantment Bay in a thunderous spectacle that lasted for hours. The Tongass National Forest, a 16.8 million acre rainforest managed by the U.S. Forest Service, occupies 77% the Southeast Alaska land. Tongass contains the largest tracts of virgin old-growth trees left in America and is the world's largest temperate rain forest. Towering mountains, cascading waterfalls, lush green forests and magnificent glaciers make Misty Fjords National Monument one of America's scenic wonders. Located in southeastern Alaska's wilderness area, the over-2.2-million-acre region is also known for its wildlife, white sandy beaches and unique ecosystems. Misty Fjords National Monument is a part of the Tongass National Forest. The first of Alaska's 18 national monuments, its rugged terrain supports many nearly untouched coastal ecosystems. Alder and dense underbrush grow in places as high as the timberline - about 2,000 feet above sea level - and lovely alpine meadows are nestled in mountain valleys. Active glaciers on the northern and eastern boundaries of the area date back to an ice age of thousands of years ago. As recently as 1920, volcanic lava flows occurred near the northern boundaries. Mineral springs are another distinctive geological feature of the region, and veins of gold, silver, copper and other minerals may be found in mountains that rise as high as Mount John Jay, at 7,499 feet. The quiet and majestic beauty of Misty Fjords might be attributed to the absence of human activity. Traces of the first human inhabitants reveal that as early as 10,000 years ago Tlingit and Haida societies settled here, and evidence of early American occupation may be found in a few places. However, today the area is uninhabited and retains its primitive beauty. Tracy Arm, south of Juneau in Alaska's Panhandle, finds sheer cliffs rising 3,500 feet from the sea, imposing tidewater glaciers. During the late 1800s, explorers to this area survived courageous trips through the rapid waters in small boats and canoes. In 1889, a survey team led by Lieutenant Commander H. B. Mansfield named the now-preserved wilderness Ford's Terror. Once the explorers made the trip up the rapids, they saw a world that had undergone few changes since the last ice age. Tracy Arm - Ford's Terror - is one of several remote locales preserved as a national park, monument and wilderness area. Twin Sawyer Glacier calves - massive chunks of ice break and plunge into the ocean. On South Sawyer Glacier, seals often cavort on the ice in front of the glaciers. The ice serves to protect young pups from killer whales, and the sector provides an excellent food supply for the animals. Within its 656,000 acres of undeveloped terrain, varied sea and bird life as well as brown and black bears, goats and eagles call Ford's Terror their home. Southeast Alaska has a unique heritage of seafaring people that stretches back in time over 10,000 years to the camps of the first people of the Northwest Coast Tribes. Alaska Natives continue their ‘partnership with nature’ through preservation of their unique traditional lifestyle. A rich oral history, passed from generation to generation, tells of a presence on the continent from ‘time immemorial’. The rain forested islands of the Inside Passage contain thousands of sites and locations portraying a variety of ancient activities of a culture that has long relied on a seafaring lifestyle in addition to the handful of present day shore side Native villages. Most of the communities are coastal and have limited or no road access. The mountains and islands make road-building between many communities impossible. Haines and Skagway are the only communities in Southeast Alaska that are accessible by road. For this reason travel by plane and boat is popular. Like the coastal Indians that paddled cedar canoes along Inside Passage waterways, modern travelers use Alaska state ferries to connect port with port. Large and small cruise ships, charter boats, and private yachts call at picturesque towns and scenic wonderlands like Misty Fjords National Monument, Tracy Arm, and Glacier Bay National Park and Preserve, located near the capital city of Juneau. Highway access from the contiguous states comes at Haines, Skagway, and the friendly ghost town of Hyder, on the British Columbia border. Scheduled airlines and charter air taxis and boats are the workhorses of southeast transportation, providing dependable access to remote and nearby locations. Because the Southeast is full of islands and mountains, transportation to remote areas is by float plane or boat. Southeast is Alaska’s “banana belt” - a land of giant trees and rainforests where wet and mild are the best terms to describe the Southeast's climate. High 40'sF to mid 60'sF are the summer norms, under cloudy skies. On rare sunny days in summer, high temperatures might reach the mid-70 degree range. Winter temperatures rarely fall much below freezing. The record low in Juneau is minus 22, compared to minus 34 for Anchorage and minus 61 for Fairbanks. The panhandle receives from 30 to 200 inches of snow in the lowlands and more than 400 inches in the high mountains. Considered an annual average is 160 inches of "liquid sunshine" (rain). The region's economy revolves around fishing and fish processing, timber, and tourism. Most of the people that live in the southeast earn a living by either logging or fishing. Spruce, hemlock and cedar are harvested by the region's timber industry, and cover many of the mountain sides. Salmon, halibut, herring, shrimp, and crab are caught by commercial, subsistence and sport fishermen.